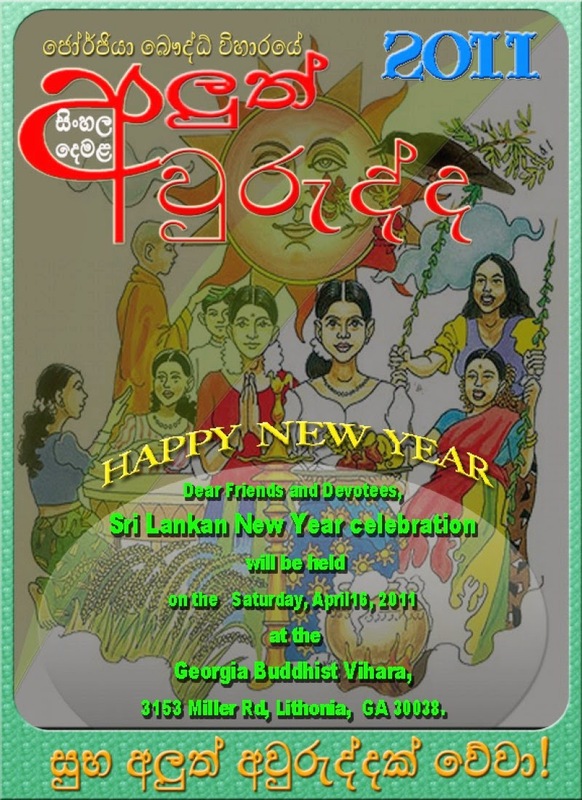 Sri Lankan New Year celebration will be held on the Saturday, April 16th, 2011 at the Georgia Buddhist Vihara, 3153 Miller Rd, Lithonia, GA 30038. 10.15 am Lighting the oil lamp. 1.45 pm Cultural Events begins with traditional dancing. Note: Parents should bring present for around $5 (wrapped and labeled with child’s name) for each of your children so that all the children will get a useful present. Volunteers are needed to bring the material for each game and to organize and conduct the games. Anyone who is willing to help, please contact the Vihara also, your generous donations for more children's gifts are appreciated. Following food menu has been suggested and any variations are welcome. Those who are interested may also bring curries to go with rice for Dana & lunch for guests. Expected turn out is 100. Three families can share bringing each food item. Please signup for food items form this link. Following games have been suggested for the children and any changes are welcome. We are seeking your contribution in making this event a success. Please feel free to forward this email to anybody who is interested to attend.